Our bespoke decorated Christmas trees are sure to enhance your interior. Deliver me a Christmas tree recruit award winning designer Lisa Reynolds and her team to dress our premium grade Christmas trees. Telephone 08455196447 or order online. Once your order has been processed Lisa will be in touch to discuss the design. London and the Home Counties only. Installation, decoration and collection times are guaranteed for this service. Our decorating service is totally bespoke. As a guide pictured below are our most popular colour schemes. 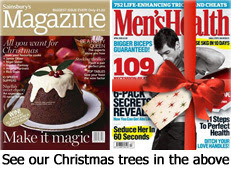 Only our finest Nordman fir Christmas trees are selected for this service. The layered, symmetrical branches and dense foliage of the premium grade Nordman fir Christmas tree will display your decorations at their best. Soft to touch, lush green and renowned for its needle retention this indoor Christmas tree is a best seller. An outstanding specimen. We will deliver and install your real Christmas tree (we supply the stand), leaving you to decorate it. After Christmas we will return and collect your undressed Christmas tree, hoovering up any needles that have shed before taking it back to our farm in Kent to be recycled. Order online and a member of customer services will contact you today to arrange collection/delivery dates - please leave a contact number or valid e-mail address when checking out. Alternatively you can place your order over the telephone. Call customer services on 08455196447.